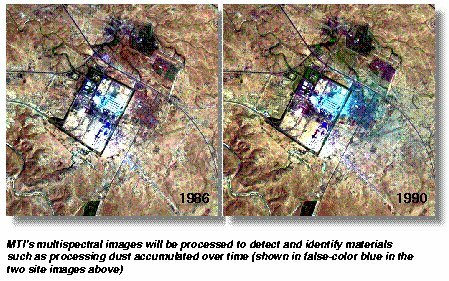 The Multispectral Thermal Imager (MTI) is a space-based research and development project sponsored by the U.S. Department of Energy (DOE), Office of Nonproliferation and National Security. MTI's primary objective is to demonstrate advanced multispectral and thermal imaging, image processing, and associated technologies that could be used in future systems for detecting and characterizing facilities producing weapons of mass destruction using radiometrically accurate, high spatial resolution, multispectral imaging. MTI technologies and experimental data also will be useful in developing future Department of Defense operations support and targeting systems. The program's considerable research effort consists of simultaneous data gathering from instrumented cooperative ground facilities and the satellite which will serve to improve and validate algorithms for characterizing facility processes from remotely measurable data. 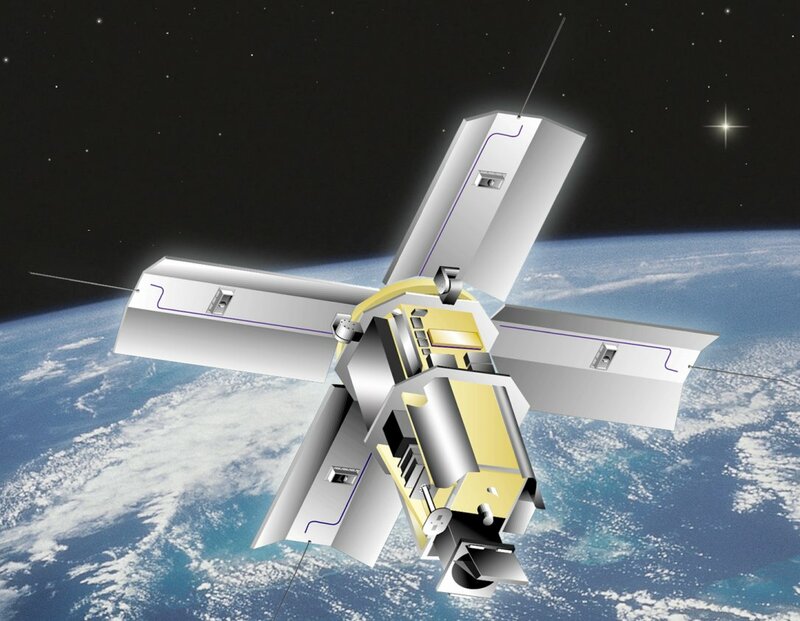 The Multispectral Thermal Imager satellite carries a sophisticated telescope that collects day and night images of the Earth in 15 spectral bands ranging from the visible to long-wave infrared. 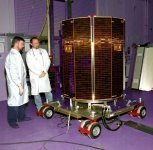 The unique imager, designed and built by a government and industry team led by Sandia National Laboratories and calibrated in a special facility at Los Alamos National Laboratory, gives the satellite performance previously achievable only in a laboratory setting. Hughes Research Laboratories in Santa Barbara, CA, built the focal plane array using three sensor chip assemblies with 12.5- and 50-µm pixels. The detectors are made of Si, InSb and HgCdTe. The instrument gathers light via a three-mirror anastigmat optical assembly built by Hughes Danbury Optical Systems in Danbury, CT. In remote chemical detection infrared (IR) sensing generally provides a valuable method for the detection and identification of trace gaseous emissions, such as might be produced by a nuclear or chemical weapons production facility. An IR remote chemical sensor consists of a sensor and a signal processor that operate in parallel to detect the presence of a pollutant. The sensor detects the signatures of all chemical vapors and backgrounds, while the signal processor discriminates between the pollutant signatures and the background emissions. The performance of a chemical sensor relies heavily on the design of optical detection by the sensor and detection algorithms employed by the signal processor. MTI's spectral bands are carefully selected to collect data needed to derive a broad range of information on facilities and activities, including surface temperatures, materials, water quality, and vegetation health. To enhance accuracy, additional bands provide simultaneous information on atmospheric water vapor, aerosol content, and sub-visual cloud presence. Imaging the Earth's surface through the atmosphere presents many challenges. But the MTI's 15-band sensor system is designed to correct for atmospheric conditions and to achieve improved radiometric accuracy. The instrument has spectral bands ranging from blue to long-wave infrared and can correct for atmospheric water vapor, aerosols and thin clouds at the same spatial resolution as the infrared imaging bands. A key achievement will be correcting spectral measurements for atmospheric effects using information embedded in the multispectral image. Process models can then be employed to characterize the activities at suspect facilities. MTI's three-year R&D mission objectives are to advance the state of the art in multispectral and thermal imaging, image processing, and associated technologies and to better understand the utility of these technologies. To achieve these objectives, researchers at Sandia, Los Alamos, Savannah River Technology Center (SRTC), and other DOE facilities will compare satellite images to "ground truth data" simultaneously collected from volunteer US sites that have been instrumented by SRTC. Because the technology is expected to have a broad range of national defense and civilian applications ranging from treaty monitoring to mapping of chemical spills, waste heat pollution in lakes and rivers, vegetation health, and volcanic activity, the Department of Energy has established an MTI Users Group, comprising more than 100 researchers from 50 national defense and civilian agencies. These researchers will conduct similar experiments using MTI images of instrumented ground sites. The satellite also carries a High-energy X-ray Spectrometer (HXRS) sponsored by the National Oceanic and Atmospheric Administration's Space Environment Center and the Czech Republic's Astronomical Institute of the Academy of Sciences, and developed by Space Devices, Ltd. of the Czech Republic. This instrument will collect data needed to better understand a rare species of solar flare associated with high-energy particle storms that can endanger astronauts and damage space equipment. The Air Force Space and Missile Center's (SMC) Test and Evaluation Directorate launched the satellite into polar orbit on an Orbital Sciences Corporation Taurus rocket. The MTI satelite will be launched into 555km circular orbit inclined at 97 degrees to earth's equator. The satellite's sun-synchronous orbit around the poles, puts it at any given point at about the same local time every day. The spacecraft solar arrays are in normal operation Sun directed with ~1 degree pointing accuracy. Data downlinks will be made to the Sandria receiving station in central New Mexico on twice daily basis. The satellite's development and on-orbit operations are funded by DOE's Office of Nonproliferation and National Security, and the launch is funded by the Department of Defense's Air Force Space Test Program. The MTI project is implemented by Sandia National Laboratories, Los Alamos National Laboratory, and the Savannah River Technology Center. Other government participants include the Air Force Space Test Program, the Air Force Research Laboratory, and the National Institute of Standards and Technology. Other major participants include the Ball Aerospace, Raytheon, and TRW. Requirements for the Department of Energy's Nonproliferation Research and Development Program are derived from Presidential and Congressional direction and from customers within the inter-agency. The program is closely coordinated at the working level with operational users and other developers and is reviewed at the more senior level by inter-agency bodies like the Counter Proliferation Program Review Committee and the Nonproliferation and Arms Control Technology Working Group. An example of the close inter-agency cooperation is the program's Multispectral Thermal Imager small-satellite. The DOE research program is focused on developing and demonstrating: sensor systems for remote detection of effluent signatures indicative of proliferation activities using active and passive optical techniques; sensor systems for remote detection of physical signatures indicative of proliferation activities using radar, multispectral, optical, and radio frequency techniques; nuclear radiation detection sensor systems to enhance nuclear material accountability and control. A successful program will result in new technologies that can be fielded by agencies charged with detecting and/or preventing the spread of nuclear weapons. These systems would be a powerful tool in determining whether or not a suspect nation is conducting a nuclear weapons production program. 1993: Instrument requirements studies completed. 1993: Preliminary Design Review Completed. 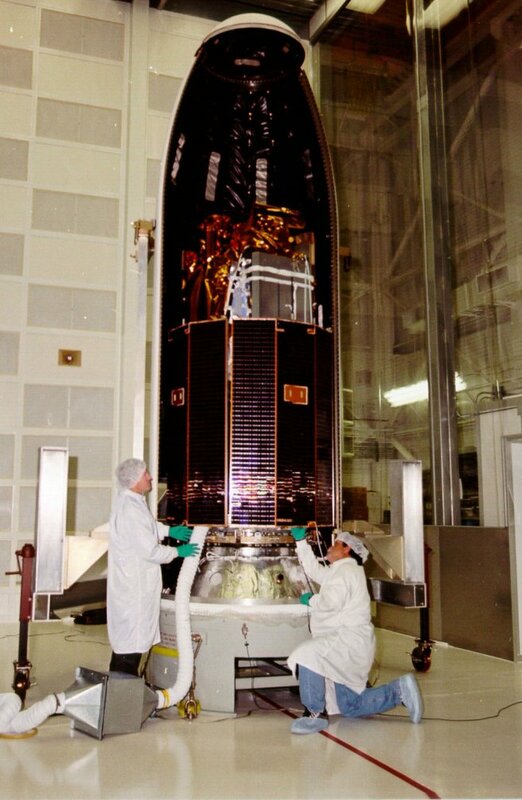 1994: Major contracts for satellite components let. 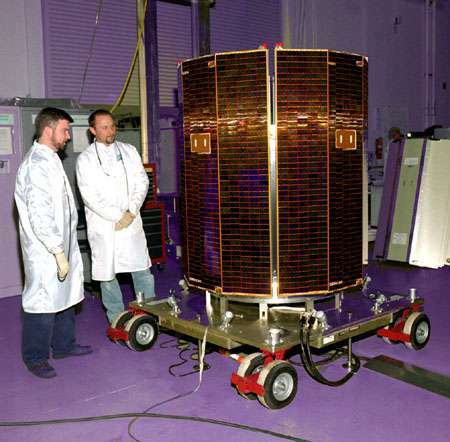 DOE satellite begins research mission 18 June 2000 -- During its three-month checkout period, the MTI satellite collected ground images of a number of U.S. sites. Imaging Satellite To Keep Eye on Worldwide Weapons Production By Andrew Bridges space.com 12 March 2000 -- "What MTI is intended to do is develop a target signature database of known facilities using a space-based sensor that will correct for atmospheric interference," said John Pike, an analyst with the Federation of American Scientists in Washington, D.C.
Sandia satellite launched successfully; technical difficulty worries MTI team Sandia Lab News 24 March 2000 - Vol.52, No.6 - The Multispectral Thermal Imager (MTI), the product of Sandia's first full satellite development program, was successfully placed into orbit early Sunday morning, March 12.